We’re proud to reveal that we have been shortlisted in two categories at this year’s British Accountancy Awards! 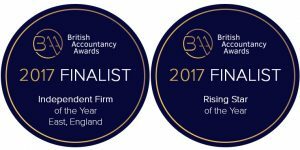 The purpose of these awards is to identify and celebrate excellence within the accountancy industry. With that said, we’re extremely proud to announce that we have been shortlisted in the Independent Firm of the Year category and that one of our own staff members, Luke Jackson, has been nominated for the Rising Star award. We look forward to 13th October 2017 when the winners will be announced at the glamorous awards ceremony held at London Hilton on Park Lane. For more information on the ceremony, please visit https://www.britishaccountancyawards.co.uk/.